Kevorkian is planning a bid for Congress. 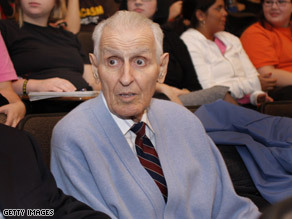 (CNN) - Jack Kevorkian, the assisted suicide advocate currently on parole from prison, is planning a run for Congress, a Detroit newspaper reported Wednesday. According to the Oakland Press, Kevorkian is planning to mount an independent bid in Michigan's 9th District seat currently occupied by Republican Joe Knollenberg. "We need some honesty and sincerity instead of corrupt government in Washington," Kevorkian told the paper. He also said his plans are in the "formative stage" and he would make a formal announcement next week. Nate Bailey, a spokesman for Knollenberg, told CNN "the congressman is working on turning Michigan’s economy around and bringing jobs to Oakland County...He’s focused on working for the people of Oakland County, not on politics." The one-time pathologist needs to gather 3,000 signatures in order to appear on the ballot as an independent candidate. Kevorkian has said he has helped well over 100 people die during the 1990s. In 1998, he was formally convicted on second degree homicide for assisting in the death of Thomas Youk, who suffered from Lou Gehrig's disease. He was released from prison on parole in June. Oakland County Prosecutor Dave Gorcyca, who was responsible for sending Kevorkian to jail, told the paper he thinks the candidacy is merely a "publicity stunt." CNN has been unable to get a comment from Kevorkian. It is time he helps the Congress with his specialty. He'll make a killing at the polls. As it is right no I think that murder in Detroit is probably at a very high level . So if he takes office it probably won't be noticed if the death rate goes up. So what's the problem. I applaude the Doctor!! Have you ever watched someone you love die inch by inch? Their body struggling for breath then becoming comatos for days? If you have, I can't imagine how you consider Dr. Kevorkian a murderer. If I could have had my mother die peacefully as she slept it would have been a no brainer. But, all my brother & sister & I could do was watch painfully as the woman who gave us life slip away with agonizing gulps of air. How many people are out there at this very minute waiting to end the inevitable on their terms with dignity? Don't think of Dr. K as a murderer, but as a realist with the humane alternative to death.
. . . .McCain / Kevorkian 08. I'd vote for Kevorkian over ANY Republican. You know where he stands. You know who he is. He doesn't lie. He doesn't steal. He's not a closeted homosexual. He didn't vote for the war. He doesn't support Bush. He isn't a millionaire. He never pushe for earmarks. He didn't gie us a $10 trillion deficit. He didn't send our economy into the toilet. He hasn't made our dollar worth less than the Canadian loonie. And the fact that he has been to prison only makes him more honest than your average Republican. Go for it, Jack! You're a better candidate than anythign the GOP has to offer! At least he follows through on his promises! Since a few people have asked about whether he can run for office, I thought I might check the Michigan and US constitutions. I only briefly scanned the constitutions, so I may get some things wrong, but on the whole I think I'm right. Funny thing- he cant vote for himself. The MI constitution bans him from voting, and the US constitution states the States regulate how voting is done in their State. MI does prevent people from running who have been convicted of a felony involving a "breach of public trust," but is what he did qualify? Plus, this involves the MI State legislature only, not the US Congress. The US constitution also does not require a criminal background check to be elected; you just need to be atleast a certain age, US citizen for so many years, and live in the district which you are running in. The only clause related to preventing people from being in Congress is the 14th amendment which prevents ex-confederates from serving if they had previously served in Congress, although this can be waived by 2/3 vote. And altough he looks plenty old, I doubt he fought in the civil war. In other words- he can run and allow us many more months of humor in an election turnign downright humorless. let him run, no one will vote for a convicted criminal who's name sounds like a mad scientist in a mary shelly novel anyway. Nothing wrong with him running. After all, we have a major criminal running for President: Hillary Clinton. She's probably had so many people killed who were perfectly healthy. I would vote for Kevorkian before OBAMA so go ahead and run, if HILLARY is off the ticket many will go over to him before OBAMA. If NOT we will go to the MCCAIN TRAIN. OBAMA is not an option!" I'd say the last four letters of your last name pretty much sum up where your brain is located. You are a complete idiot. If we can vote George W Bush to be our President, we sure can vote for Kevorkian to be our congressman. Hillary's VP. Hmmmm now that just cracks me up. LOL. He should have run with Huckabee and put Huck's campaign out of our mystery a lot sooner. Oh come on Jack,you're killing me. One good thing about the Michigan ballots was that they were paper form. Now – get to counting, if "they" intend to make this revote thing reality. Reason being, only those people who voted Democratic should be allowed to vote again. Otherwise, what's stopping any Republican turncoats from biasing the election in favor of Clinton? Any chances of a revote in either Florida or Michigan is looking very grim. Sorry Jack, but I had to post here, there are no other posts open. You can run for office with a felony conviction, but usually, the felony conviction comes after being elected. He will just be ahead of the curve. The man is a disgrace. He MURDERED people. He should be in jail, not Congress. Though, I guess the residents of both are similar. You gotta love this country!!!! another unusual one. How is possible to let people like this to even think about it? Where is the common sense? How person like this can serve the public? maybe he needs more to help to go...............? this guy brings the "vote or die" phrase home. I bet p-diddy will be jelous. now, everyone will be roaring into the high positions, White House. Maybe we will see more of unusual candidates? I wish there would be the right genius who will put this country in peace and prosperity. And everyone would want this person to be the leader. Where is this person? No fights, no empty words, no wars, no bad economy, no poor school systems, no struggling, no.........where is this dream land, this dream people, this dream of ideal.......?